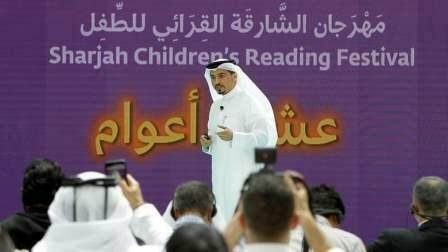 A total of 134 publishers from 18 Arab and foreign nations will participate in the 10th edition of the Sharjah Children's Reading Festival (SCRF). It will be held from April 18 to 28 at Sharjah Expo Centre. The SCRF, hosted under the theme, 'Your Future. Just a Book Away' by the Sharjah Book Authority (SBA) will host 286 guests from 121 countries and will have 2,600 events and activities. This year will also be characterised by distinctive features such as 3D books, Pop-up books exhibition, Future Machine exhibition, SCRF mascots and Little Chef' competition for age groups 6-10 and 11-16 years. Addressing a Press conference, Ahmed Al Ameri, chairman of the Sharjah Book Authority (SBA), said: "Of the 134 participating publishers, the UAE tops the list with 62 representations, followed by Lebanon (22), Egypt (21), Jordan and the UK with five publishers each, in addition to USA, South Korea, and China, among others." SCRF 2018 will host of series of interactive activities spanning several programmes under the main themes of Kids Activities, Cultural Programmes, Cultural Café, Kids' Creative Café, Social Media Café and Cookery Corner. For the first time, workshops will be held in spaces that will be similar to labs where participants will enjoy a heightened level of interaction. It was revealed that some of these activities will be held in the same areas where publishers will set up their exhibition stands to bring children closer to books and other sources of knowledge while enabling parents to enjoy these events with their children. In a bid to make the festival more appealing to children, four new characters have been brought to the SCRF. These mascots - Wamda (Flash), Qalam (Pen), Noqta (Dot) and Shuaa (Beam) - depicted as inhabitants of a distant land and a future far away, will be in Sharjah throughout the festival to accompany the young festival-goers on their journey of fun and learning. More than 1,200 name suggestions were entered as part of an SCRF social media contest. The winners whose names were chosen will be awarded at the festival. Khoula Al Mujaini, events coordinator at the SBA, outlined the list of the headlining Arab and foreign authors and artists this year. They include Egyptian actress Sabrin, Bahraini actress Haifa Hussein, Egyptian actor Abdul Rahman Abu Zahra, Algerian artist Tareq Al Arabi Tarkan, and Syrian actress and dubbing artist Amal Hawijeh. Foreign guests include British children's book author Sibéal Pounder, American poet and author Mark Gonzalez, award-winning Indian children's author Natasha Sharma, Indian actor and producer Varun Pruthi, British children's author and illustrator Ed Vere, and American award-winning children's author Miranda Paul. Live visual shows offering children insights into the new digital age, models, and replicas that run on the basics of artificial intelligence and the principles of how robots function will be some of the exhibition's attractions. It will bring together 250 pop-up books from the 3D Book Centre in the Italian city of Forli. The books on display will represent eight periods of time, starting with The Beginnings (1880), and From Three Dimensions to Modelling (1920), and The Birth of the Concept Model (1930), The Fan (1940), The Global Achievement (1950), Kopasta Books (1960), Phase of Modelling Books (1970), and finally, the New Amazing Millennium (2000). The Sharjah Children's Books Illustrations Exhibition will feature 355 artworks by 104 illustrators and artists from 32 countries. This will include 29 artists from Arab countries and 67 illustrators from the rest of the world. The first robotics centre in the UAE dedicated offering opportunities to children and adults to develop their knowledge and skills in science, technology, engineering and mechanics. At the festival, they will organise several intellectually stimulating workshops and activities on a range of interesting topics. Social Media café will see the participation of a number of famous social media influencers, both young and adults, to enrich children's knowledge and experiences, and offer them useful information, since social media platforms are increasingly used by young individuals for both entertainment and learning. Through its numerous activities, the social media café will seek to strengthen the youth's awareness about major risks of sharing information via social networking platforms, guide them on how to use online channels safely and beneficially.